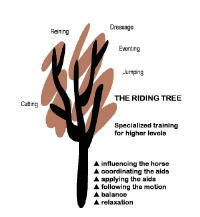 Our goal as we move up the riding tree is to develop an independent seat so that we can influence the horse. An independent seat means that you are not relying on anything but balance to hold you on the horse. You use an athletic muscle tension to help you stay in balance but you are relaxed, not gripping with your muscles to hold you on the horse. Once you are in control of your own body, you can begin to influence the horse and control its body. The first step in developing an independent seat is learning to relax while sitting on the horse. The second is learning to balance your own weight over the horse’s center of gravity. The third is learning to feel and follow the horse’s motion at the walk, trot, and canter. “Following” does not mean just sitting and passively letting the horse’s motion swing you along. It is an active muscular activity that aligns your rhythm with the horse’s rhythm and puts the two of you in harmony. The rider needs to be aware of various body parts. She needs to be riding in balance, using elastic, athletic muscle tension to help her stay in balance rather than tight, gripping, nervous muscle tension. It takes strong abdominal muscles and loose, flexible hip joints that open and close smoothly. Being able to follow the motion is an essential skill the rider needs in order to ride in rhythm and harmony with the horse. Without this independent seat where you have total control of your body parts, you are always going to be limiting your horse. A good instructor will choose school horses that can help a rider in whatever phase she is in at the moment. A good schoolmaster can help a rider become more relaxed and balanced so she can learn to follow the motion. Many instructors use longeing to help riders develop a feel for the horse’s motion. This understanding of it is fairly simple. But mentally understanding it and applying it physically takes a lot of hard work and mental concentration. It takes a lot of hours in the saddle on a lot of different horses to achieve a truly independent seat and there are going to be a lot of times when your progress seems very uneven. You get it on one horse but not another. You jump ahead on one horse but fall back on another. The key is to accept the feedback you get from each horse you ride to help you pinpoint weak areas. The horse’s reactions are clues to whether you’re not following his motion properly. When people get ahead of or behind the horse’s motion, they put the horse out of balance. The horse will try to correct this so he can feel comfortable and in balance again. If you fall behind the motion, the horse will either sense that as a driving aid and run forward or he will slow down, maybe even stop, as he tries to position you back over his center of gravity where it is most comfortable for him to carry your weight. Most people tend to get behind the motion. Our typical student riding at least twice a day spends about a year developing the necessary skills and muscles to be able to ride at all three gaits first, with relaxation; second, in balance; and third, while following the horse’s motion. During that year, there will be times when the rider might easily achieve all three of those goals at the walk but find that it is really difficult to stay steady over the horse’s center of gravity at the trot. Or she has no problems with following the horse’s motion at the walk and the trot but find she’s unable to achieve the right degree of physical relaxation at the canter to follow the horse’s motion on both leads. It’s a very normal thing in the development of the seat to hit plateaus. Just remember that everybody progresses differently and even if it takes you longer at one step, you might fly through the next two or three steps when you reach them. Expect plateaus and blocks from time to time and don’t get discouraged or frustrated because they will happen. Be aware that it is normal. The body awareness and control you are trying to develop is very complex physiologically and psychologically. A lot of times in order to progress, you have to give up some level of control you’ve used and start all over again. The rider who’s been staying on the horse by gripping may feel she’s “balanced” on her horse. However, if she’s going to achieve a truly independent seat, she’s going to have to give up the security of her grip in order to learn how to ride with relaxation and true balance. Until she does, she’s not going to be able to follow her horse’s motion. She’s going to get stuck on a plateau. The irony is that when she gives up her grip, her riding is actually going to regress for awhile. That frustrates many people and makes it hard for them to give up the bad riding habits they’ve developed that at least give them some sense of control. The reality is that unless you are able to give that control up and reeducate your body, you are not going to be able to progress to the next level. If you don’t have an independent seat, you will still influence the horse but your influences are going to create the wrong results and frustration for both you and the horse. Before you and your horse can play at the upper levels of whatever game you have chosen, being able to stay relaxed, to stay balanced over the horse’s center of gravity, and to follow the horse’s motion at all gaits is essential.